The hope of spring (Director’s Desk) (PDF) — Jeff Stone, OAN executive director, looks at how the principles of winning baseball on a modest budget might help the nursery industry win in the marketplace. You can now view our Classifieds online. 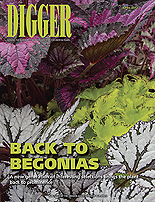 Simply click to download the most recent version (Note: Updates every month).Digger has been serving the nursery industry in the Pacific Northwest and nationwide for more than 50 years. It is mailed for free every month to nearly 8,000 nursery professionals. Would you like to be one of them? Simply fill out this handy online form. Would you like to advertise in Digger or other OAN publications, or sponsor an OAN event? It’s a great way to reach industry professionals. Check out our new Exposure Kit for 2012.